WeTip & Omnitrans Introduces Proactive “Don’t Touch the Driver” Safety Campaign | WeTip, Inc. 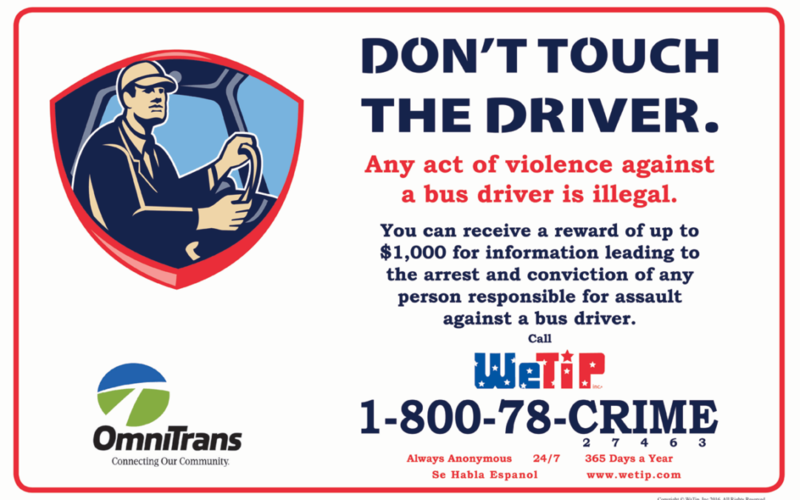 In partnership with WeTip, Omnitrans is introducing a new safety campaign, “Don’t Touch the Driver.” on its buses and at transit centers to remind the community that any violence against bus drivers is a felony offense. “Although driver assault hasn’t been a particular problem for Omnitrans, it unfortunately has been on the rise across the nation. We definitely want to take a proactive role in protecting the safety of our employees and customers,” said Omnitrans Security & Emergency Preparedness Coordinator Mark Crosby. The Proactive “Don’t Touch the Driver” Safety Campaign campaign features a simple graphic and the information that any assault against a bus driver will be prosecuted. As is typical of WeTip campaigns, anyone who has information that leads to the arrest and conviction of someone responsible for such an incident is eligible to receive a $1,000 reward. Omnitrans information is found at 1(800) 966-6428 or Omnitrans.org; to contact WeTip, call 1-800-78-27463 or visit www.wetip.com.